Home / Unlabelled / Aakash 2 tablet made in China? Aakash 2 tablet made in China? 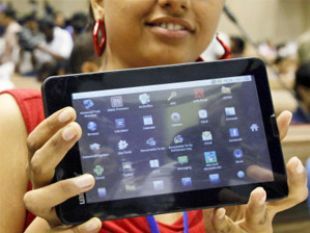 The much-publicised world's cheapest tablet, Aakash 2 launched by President Pranab Mukherjee on November 11, may have been a cheap import from China, embellished with some applications from IIT Bombay, and not an Indian innovation that it was made out to be. Documents in possession of ET show that about 12,000 devices-A13 model designed by AllWinner Tech of China-were procured by Datawind, the supplier selected by IIT-Bombay, which is implementing the Aakash project on behalf of India's ministry of human resources development. This was done just weeks before the launch date. This also puts a question mark on ministry of external affairs showcasing the low-cost computing device at United Nations as a product of Indian innovation. These tablets costed about $42 each (Rs 2310) each and were shipped to India by Kalong Technology Co. Ltd, Dasen International Electronics Co Ltd and Kalong Technology Co Ltd. Interestingly, IIT-Bombay is learnt to have issued a certificate dated October 29 for importing about 20,000 tablets into India, and recommended import duty waiver, just days before the launch of Aakash 2. Datawind sold the Chinese-made devices to government branding them as Aakash 2, at a price of Rs 2263 each. Datawind CEO Suneet Singh Tuli said the touch panels used in the device were manufactured in Montreal but "consolidated in Hongkong or China" for expediency. "Final assembly and programming of all units is done in India," Tuli said. "We have designed the motherboards and write our own software that goes into the tablets and also have developed much of the enclosures and mechanical parts." A senior government official involved in the project did not know whether the products procured were off the shelf tablets from China. NK Sinha, additional secretary and Minister for Human Resource and Development M Pallam Raju, did not reply to ET's emails. Mails and calls to IIT Bombay during the week by ET on whether the institute knew the product is a cheap import from China did not elicit any response. Another reason that might have forced Canada-based Datawind to import device from China may be a standoff with its Indian partner VMC Systems, which was supposed to assemble the device in Hyderabad. It is learnt that VMC halted shipments, and threatened Datawind with legal action in October, citing non-payment of dues. VMC Systems, which makes chargers, adapters and other telecom equipment In India, had assembled about 20,000 tablets for Datawind, by importing components from countries like China and Taiwan. VMC claimed Datawind "hasn't paid for a single tablet". VMC said it stopped production in November. "Although the balance payment for the units shipped to Datawind has been longer than usual, we are treating this as just a delay," Murthy told ET in an email. In response, Datawind's Tuli said that they no longer provide information about their subcontract manufacturers but that "it would be inaccurate to say that VMC no longer manufactures for DataWind."